British artist Yinka Shonibare MBE (RA) (b.1962) received his MFA from Goldsmiths College, London, as part of the ‘Young British Artists’ (YBA) generation. Born in London, Shonibare moved to Lagos, Nigeria at age three. His work is famous for exploring issues like colonialism and post-colonialism in the contemporary context of globalisation, including discussing issues of race and class. The artist deploys a multifarious repertoire of media that entails painting, sculpture, photography, film and live performance to investigate themes such as identity construction and tangled interrelationships between Africa and Europe, and the two continents’ respective economic histories. The artist mixes Western art historical narrative with literature and questions contemporary identity and its construction in a globalised world, where cultural and national definitions become increasingly blurred. Shonibare has described himself as “post-colonial hybrid”. In 2004, he was a Turner Prize nominee and awarded the decoration of Member of the “Most Excellent Order of the British Empire” (MBE), the title which he has added to his professional name. His most recognised work, Gallantry and Criminal Conviction, commissioned for and first exhibited at Documenta 10, launched his career as an internationally acclaimed artist. Shonibare has had numerous solo exhibitions around the world, including FOCUS: Yinka Shonibare MBE, Modern Museum of Fort Worth, Texas, Yorkshire Sculpture Park, Wakefield, and Stephen Friedman Gallery, London, all 2013; Imagined as the Truth, San Diego Art Museum, San Diego, 2012; El Futuro del Pasado, Alcala 31 Centros de Arte, Madrid, 2011; Human Culture: Earth, Wind, Fire and Water, Israel Museum, Jerusalem, 2011; Yinka Shonibare MBE, Lethaby Gallery, Central Saint Martins College of Art & Design, London, 2010; A Flying Machine for every Man, Woman and Child & Astonishing Works, Santa Barbara Museum of Art, California, and A Flying Machine for every Man, Woman and Child, Miami Art Museum, Miami, both 2009; and Yinka Shonibare MBE, Museum of Contemporary Art (MCA), Sydney, touring to Brooklyn Museum, New York, and National Museum of African Art, Smithsonian Institute, Washington DC, 2008. Shonibare was publicly commissioned to produce Wind Sculpture for Howick Place, Victoria, London, 2013; The Fourth Plinth, Trafalgar Square, London, for which he made Nelson’s Ship in a Bottle, 2010-2012 (now at the National Maritime Museum, Greenwich, London); and by the Royal Opera House, London, for Globe Head Ballerina, 2012. 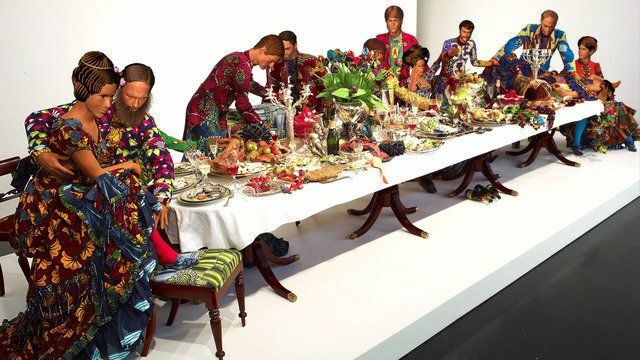 Yinka Shonibare MBE works and lives in London.